A couple of days ago, on January 17th, the new Daily Spending Report Feature of the Azure Cost Monitor went live. We are very pleased that the reports were adopted so well. We got some nice feedback from our users appreciating the new functionality. This feature has been build to reflect what our users told us they need – a simple way of tracking all Azure cloud costs on a daily basis and transparency for every stakeholder in the company. The daily spending reports make it easy for the Operations Department to track the cloud spendings and react upon this data immediately. Controllers of the Finance Department need to understand what the company is spending throughout the month. 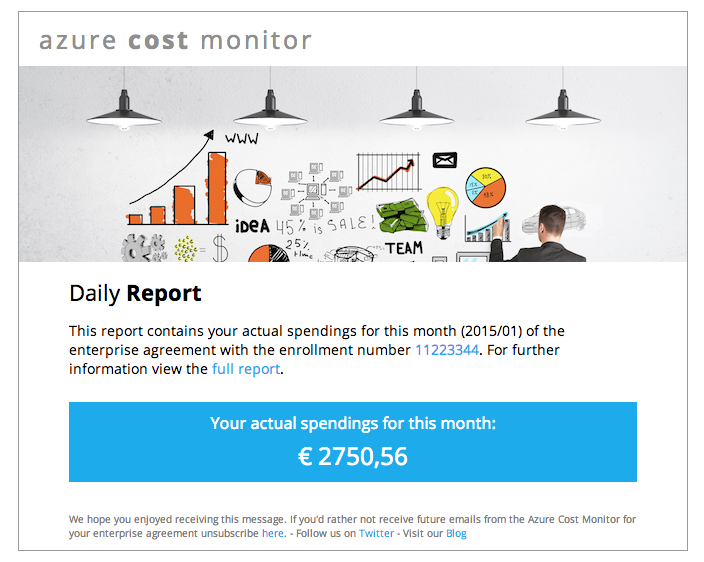 Azure Cost Monitor reports give them a convenient way to have a good overview on a daily basis. Managers always need to be aware about the most important KPIs within the company. The new daily spending reports of the Azure Cost Monitor give them the freedom to always have a quick and precise overview on the company’s cloud spendings. Whenever you’ve got any questions, wishes or further ideas please don’t hesitate and let us know by leaving a message or request them in our feedback portal.